If you’re a new parent, you know the frustration that comes with putting a crying baby to bed. There is gut wrenching agony as you try to determine if you should let them cry it out. You might think, maybe you’ll just peek in and check. But that only starts the whole thing over again. But then, some well-meaning person told you an easy fix. Just put the baby down with a bottle. Wow! That was so easy! Why didn’t you think of that before? Then, as soon as the baby’s asleep, you can tiptoe in, gently get the bottle out and jump into your own bed for some well needed rest. While it’s tempting… Be careful! Sending the little one to bed with a bottle may have long term ramifications. First, your child needs to learn to fall asleep without any crutches. But what’s worse, you could be contributing to Baby Bottle Tooth Decay! You see, milk contains lactose – a form of sugar. Just like in an adult mouth, prolonged exposure to that sugar along with the bacteria found in the human mouth can work to accelerate tooth and gum decay. 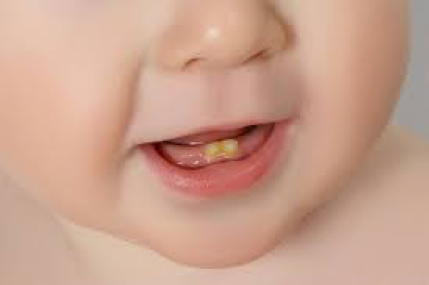 Your baby needs those little baby teeth for a variety of reasons. Your job as the parent is to make sure the teeth are as healthy as possible as the child grows. That way, they’ll grow up to have a much healthier adult mouth. Put water in the bottle—If your baby needs something to drink in their crib, give them a bottle of water. Begin brushing your baby’s teeth—When those little first front teeth pop up, grab the toothbrush and begin. Let your baby get used to the feel of the brush in their mouth and the process of brushing in general. Do this at least once a day. Check the sugar content on any snacks for your little one—Many snacks, even though they claim to be healthy, are high in sugar. They are not good for your baby’s teeth either. Also, for added information, make an appointment, or have a question answered, you’re more than welcome to call us at Airdrie Springs Dentist at 587 317 4161 or click here to visit our website.